At least 5 trillion cell divisions are required for a fertilized egg to develop into an adult human, resulting in the production of more than 20 trillion meters of DNA! And yet, with only two exceptions, the genome is replicated once and only once each time a cell divides. How is this feat accomplished? What happens when errors occur? This book addresses these questions by presenting a thorough analysis of the proteins and sequence of events that govern DNA replication in all eukaryotic cells and by revealing linkages between DNA replication, cell proliferation, human disease, and targeted therapeutics. For example, at least 160 different proteins are involved in replicating the human genome, and 80 genetic diseases result either from mutations in these proteins or from errors in DNA replication or repair. In addition, more than 40 diseases result from replication of DNA viruses, and at least 14 therapeutic drugs are targeted to DNA replication proteins. 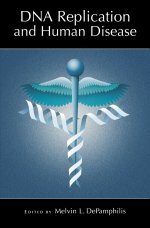 Not only will this book provide a rich source of information for researchers, medical doctors, and teachers, but it will also stimulate thinking about the relevance of DNA replication to human diseases. For additional information on this subject, chapters from the out of print CSHL Press monograph DNA Replication in Eukaryotic Cells can be downloaded here. Since 1933, the publication of books and other media by Cold Spring Harbor Laboratory Press has assisted the Laboratory's purpose of furthering the advance and spread of scientific knowledge. CSHL Press publishes monographs, technical manuals, handbooks, review volumes, conference proceedings, scholarly journals, and videotapes. These examine important topics in molecular biology, genetics, development, virology, neurobiology, immunology, and cancer biology. Manuscripts for books and for journal publication are invited from scientists worldwide. Revenue from sales of CSHL Press publications is used solely in support of research at Cold Spring Harbor Laboratory.